Description: Sexes similar. Dark brown above, with white streaking on crown and back; indistinct whitish eyebrow; underparts are mainly buff. Habitat: Found during the breeding season in wet meadows, especially those dominated by sedges and tall grasses. Occurs less often in emergent vegetation of marshes, retired croplands, and hayfields. 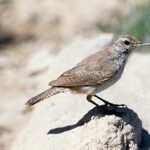 Where in Nebraska: Uncommon spring and fall migrant in eastern Nebraska. Rare summer resident in eastern third of the state, mostly east of a line from Knox to Gage Counties. Fun Facts: One of our more nomadic species. 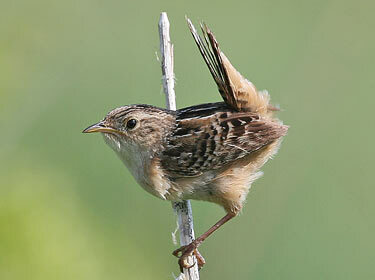 Additional Information: Formerly called the Short-billed Marsh Wren. More often heard than seen. 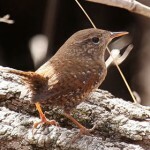 Often destroys eggs of other small birds nesting in close proximity, including other Sedge Wrens.